Veroboard is a remarkable product, continuously available and literally unchanged since my youth… I’ve been using it for over 40 years. It is phenolic board, punctuated by a grid of 0.1 inch holes, with bonded copper strips running its length. To use it, you push thru-hole component leads through and solder them to the tracks, cutting the copper over a hole to break a conducting bus as required. Tribal knowledge holds that the small amounts of capacitance between adjacent copper strips makes Veroboard unsuitable for use at radio frequencies. Well it obviously worked for Charlie. It made me wonder, what might the capacitance be? Then it dawned on me how easy it would be to measure it. 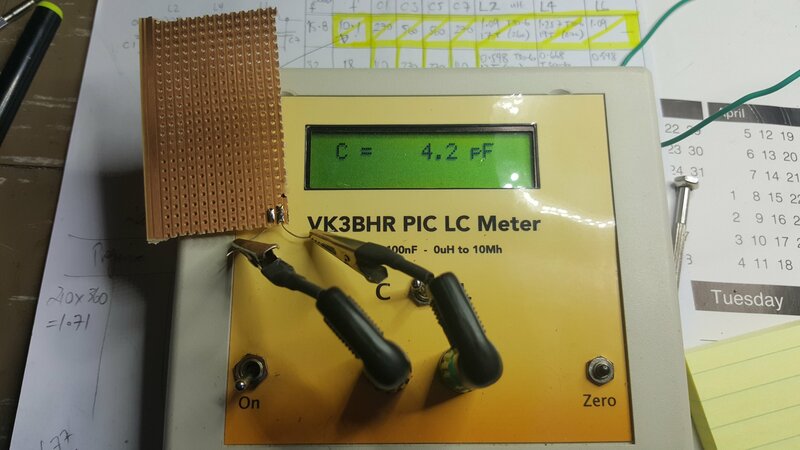 I soldered two leaded component tails to adjacent tracks on a scrap of Veroboard and measured the capacitance on my LC Meter. On a piece of board 6cm long I got 4.2pF. What about two tracks separated by a track? 2.7pF. What if I tested the longest piece of Veroboard I could find? On a piece 18cm long I measured 11.8pF between adjacent tracks. I dropped Charlie a note on YouTube. VK3HN> I was wondering if the Veroboard would introduce capacitance by virtue of the parallel conductors. Soldered pigtails to the end of adjacent tracks and measured 4 pF. Wonder if this is material at 8MHz? Best way to tell would be to make up a second filter ugly style and compare. Probably not worth doing but an interesting thought! ZL2CTM> That could very well be the case. I do try and break tracks where they are not needed in an effort to prevent outputs from influencing inputs. I’ll probably leave it for now and compensate it in software. I found a forum thread discussing this topic. People suggested grounding all unused tracks to form a patchwork ground plane, trimming tracks as short as possible, and even applying excessive soldering iron heat to lift unused tracks. In summary, random capacitance of a few pF scattered around a module might not be an issue up to (say) 10MHz, and sensible techniques like grounding as much copper as possible should help. I wouldn’t do it with a gain stage, like a grounded gate JFET or dual gate MOSFET RF amplifier, even at low radio frequencies, where a hint of stray capacitance can initiate VHF oscillations. But for low or zero gain low radio frequency or audio circuits, Veroboard might be a reasonable choice, if you want to avoid cooking up a custom PCB or working Manhattan/Ugly. Paul M0XPD has some Veroboard BiTx modules, which worked fine for him at BiTx frequencies, here. My experience in the 60’s and 70’s with phenolic based pcb’s agrees with you to a point. Grounding un-used strips only puts the capacitance to ground instead of to another circuit. In some cases this might be desirable but not in all. Could attenuate signals. Also, the fact that I was using actual pcb rather than vero board didn’t lessen the tendency for stray capacitance. Wasn’t much of an issue for me at AF/HF frequencies but became a real issue at VHF and above so I had to change to G4 material. These days I think it’s referred to as FR4. Anyway, well done! Thanks for commenting Ed. I concluded that Veroboard is OK for lower HF uses, say up to and including 10MHz, but only zero or low gain stages, and care must be taken, keeping input signal tracks shirt, grounding all unused tracks. And it would help to mount the veroboard over a good ground plane such as a copper PCB panel or aluminum chassis panel. DK7IH (google his call to find his blog) uses a similar board, not Vero with strips, but the matrix board with plated thru holes. He runs heavy bus wires or copper/brass shim to form a decent ground plane, at frequencies up to 14MHz, including 50 watt power amps! So it can be done.